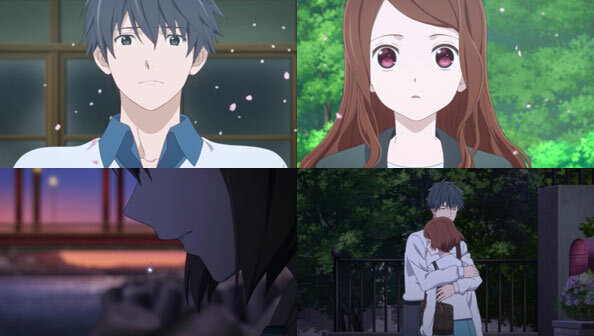 The standoff with what is apparently the “Rounders” of SERN mercifully ends without any tragic deaths, thanks to the sudden arrival of Tennouji, who makes quick work of the masked bandits, while Suzu frees their quarry Kagari from their clutches. 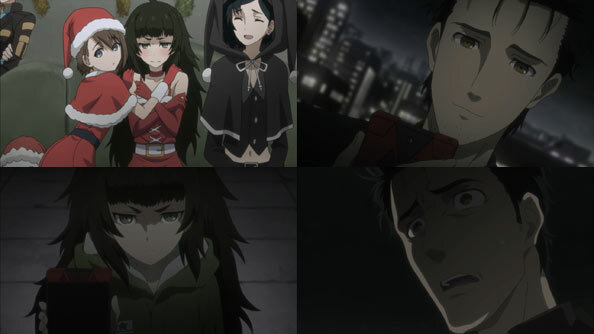 Their leader in black has a female figure, but Okabe almost immediately doubts it was Kiryuu Moeka again because the Akiba boss from the other world line was Braun; it would make no sense for him to hinder the Rounders here. Something else is clearly up. The first priority is ensuring Kagari’s safety going forward now that they know she’s particularly susceptible to capture. 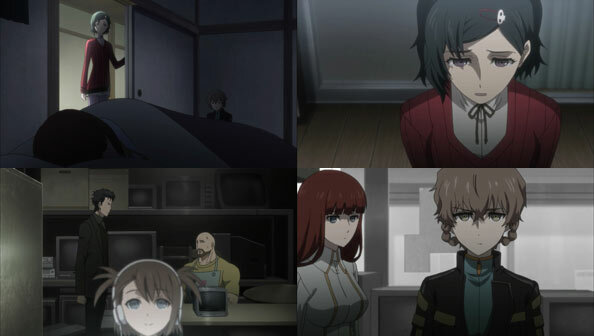 She continues to stay at Ruka’s place, which Daru fortifies with motion sensors while Suzuha keeps a sleepless watch. 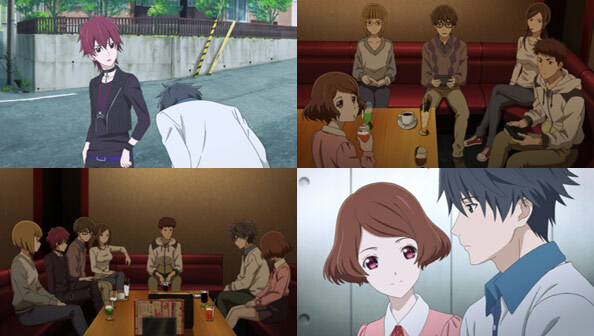 Ruka can tell something’s up, and wants Suzuha to explain why she uses the family-based honorifics she uses…but Suzuha isn’t talking. 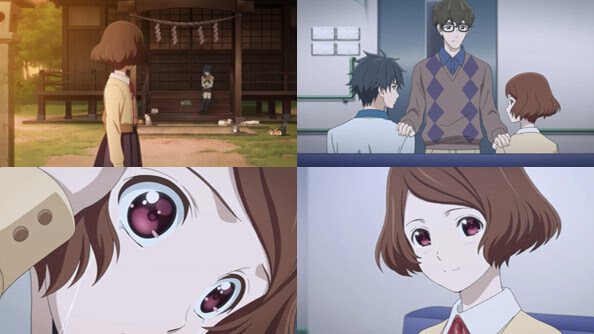 She (rightly) believes Okabe wants to keep Ruka from learning anything about other worlds, so that he can stay in the one he’s in. 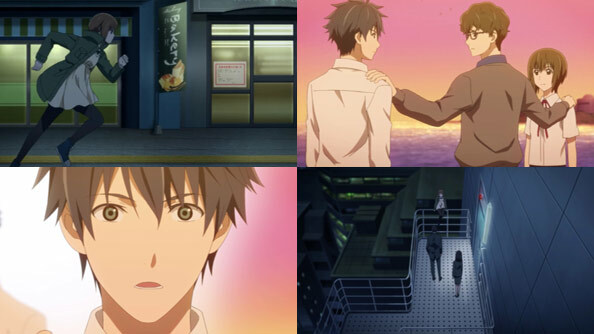 The next day Okabe visits Tennouji at the shop to explain the disturbance he had to break up (not the kind of landlord duties he likes undertaking, even if he’s more than capable). 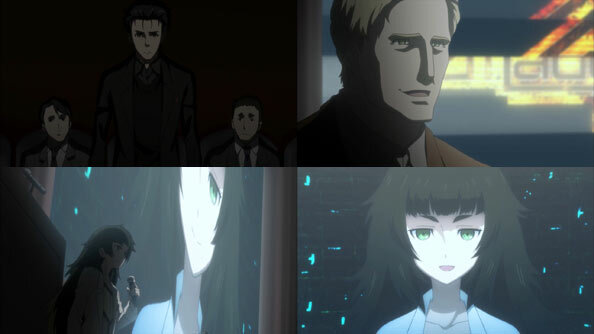 Okabe first confirms that Tennouji is indeed Ferdinand Braun, affiliated with the Rounders. 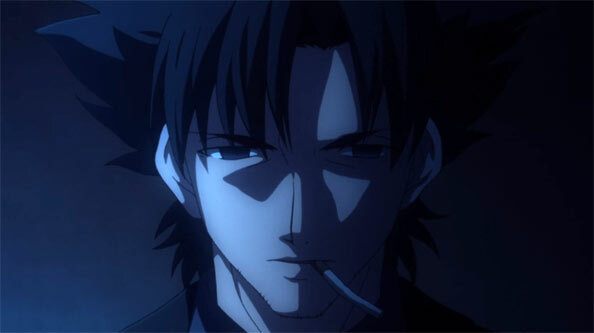 Braun concedes that Okabe is disturbingly accurate about things he has no business knowing, and in the absence of more credible explanations is willing to at least hear him out about time travel and world lines. 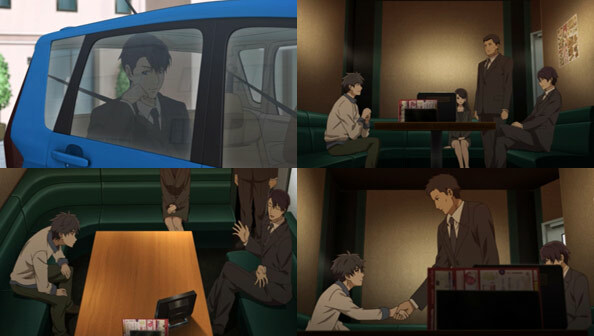 He agrees to keep Kagari under his protection, hiring her and Suzuha as part-timers, but insists Okabe get to work discovering the identity and goals of Kagari’s would-be captors. 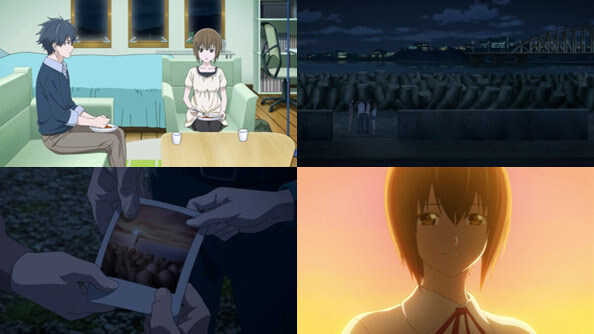 One clue is the alphanumeric code uttered by two of the Rounders: K6205, whom Mayushii’s friend Kaede is able to identify as possibly a Köchel number; those used to catalog the works of Mozart. Specifically, K. 620, his opera The Magic Flute, which is packed with Masonic elements. Scene 5 of Act 2 involves a man being ordered to marry an elderly woman or he’ll be imprisoned forever. When he does, she’s transformed into a young and beautiful young woman, only for priests to hold him back, warning that he’s not yet worthy of her. I learned all of this on Wikipedia, as Daru and the others’ primary source of research (always a good place to start, anyways). But one can’t think of the Mozart connection without also thinking about his middle name: Amadeus; ‘loved by God’. 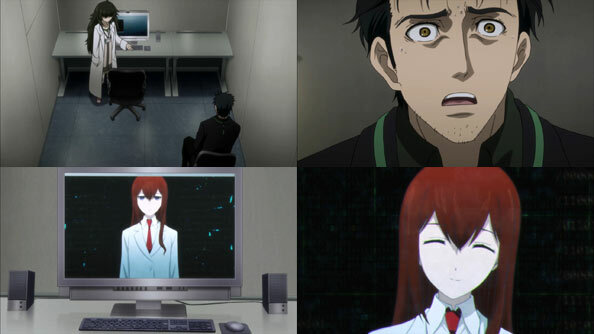 Amadeus is still offline and when Okabe calls Hiyajou, she expresses her fear the server has been taken over. 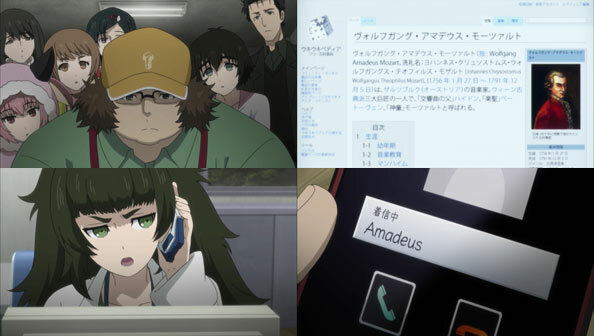 But moments after Hiyajou hangs up Okabe gets a call from Amadeus. It’s highly distorted and garbled, but Amakurisu pleads for help clearly enough. 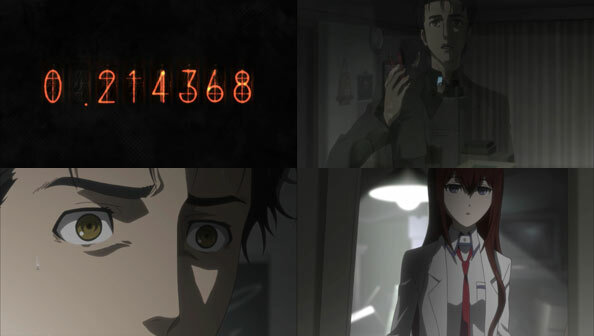 That’s when Okabe enters Reading Steiner, the Divergence Meter’s Nixie Tube numbers flutter furiously. He ends up alone in the lab, the TV no longer shot through, and the Amadeus app gone from his phone’s home screen. 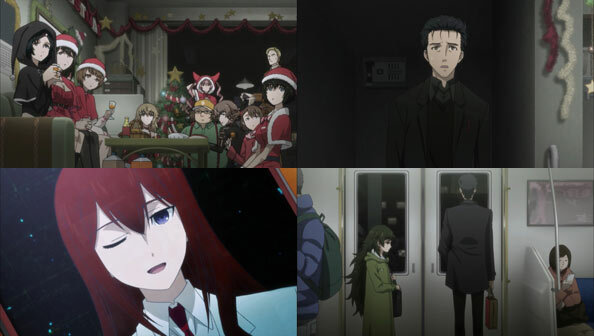 It’s a World Line Change, people, and what do you know, Kurisu is alive in this one. 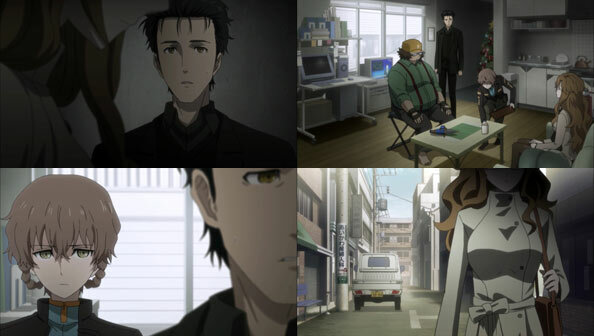 Just like the first Steins;Gate series, S;G 0 started off slow, but there was always the possibility, even probability that one big event after another was bound to go down soon. 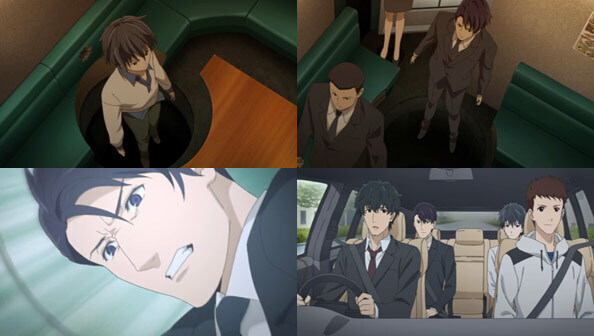 Now we’re there, with Okabe, in a totally different world than the one in which 0 started, with no knowledge of how he got there, whether he’s been there before, or if he’ll ever get back. Not to mention the fact that without even trying he’s been reunited with the only woman he’s ever loved. 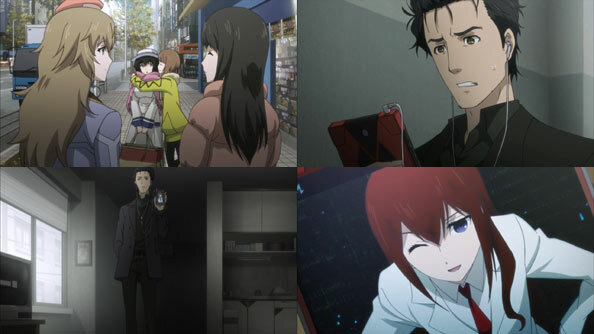 Depending on how things go, he may not even want to leave…but where Steins;Gate is concerned, getting something you want almost always means losing something you need. 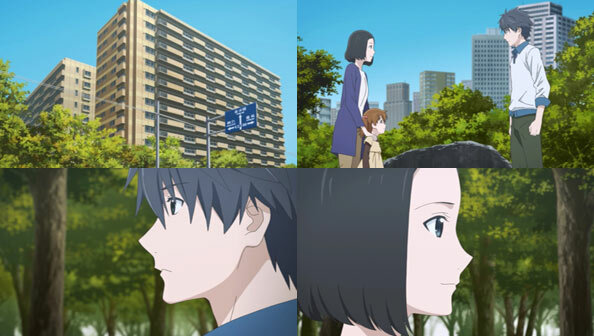 “Kana” is definitely Shiina Kagari—even if the Oopa were a copy, there are certain things (the sound of her name, words from her future adoptvie mother) that give her an odd sense of nostalgia. And Suzu would recognize the girl who pulled a gun on her a mile away. 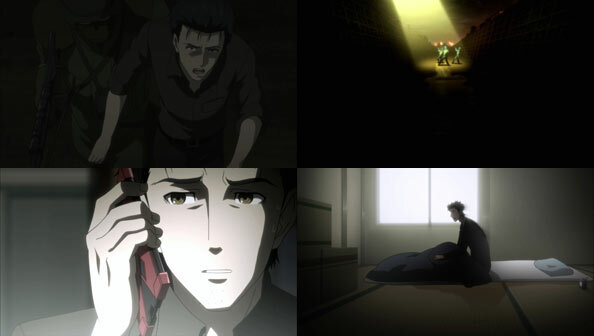 Okabe contacts Kiryuu to tell her Kagari has been found, but to request she continue investigating the group that was after her. 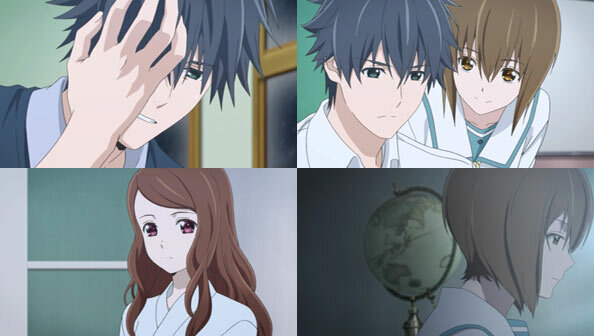 After Kiryuu hangs up, we get our first sense that something is going to come to a head this week. Little did I know when watching her teasing Maho that Judy Reyes of all people could also be involved. It’s New Years, so the whole gang goes to the shrine, both to pray and give offerings and see Mayushii, Rukako, and Feyris in shrine maiden garb. 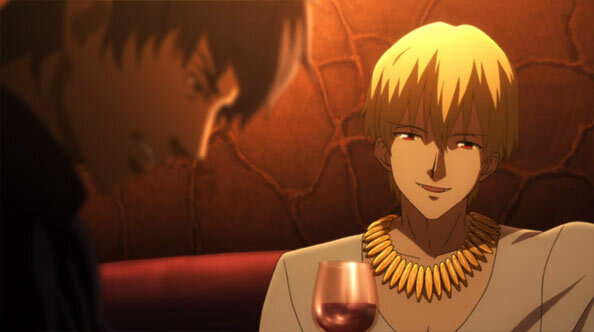 Everyone has lots of fun, but Judy shows up with Leskinen to say a quick ‘Hi’, while turning to leave she spots Kagari and gives her one hell of a sidelong glance. 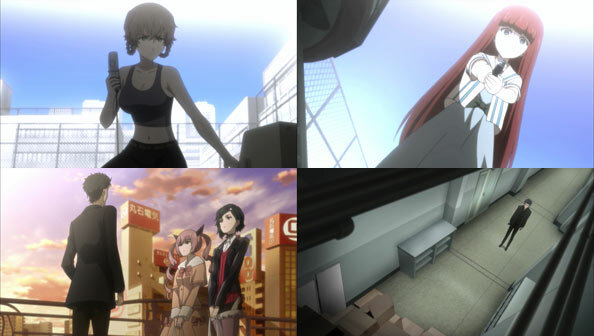 There are more foreboding doings as Tennouji acts particularly shifty and a man in black lurks behind a wall, all while Mayushii & Co. bring the party to the lab and continue enjoying themselves. 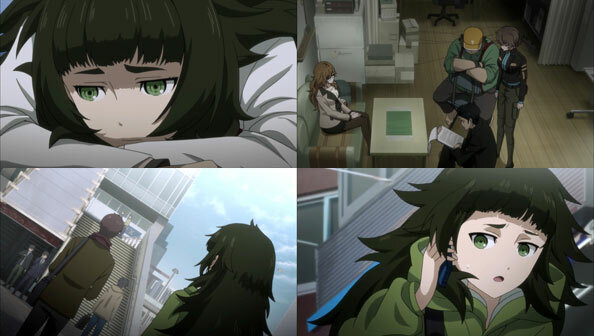 Maho is among those having a good time, but gets a sudden video call from Amadeus, and answers the phone without leaving the room. 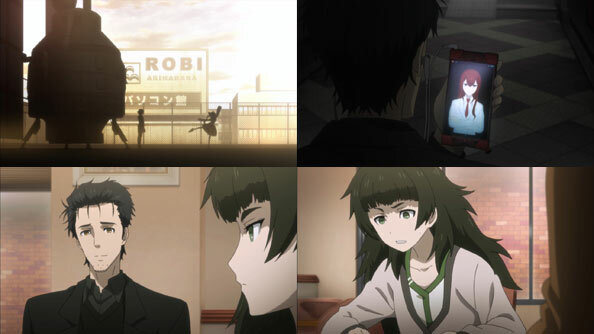 Before long she’s surrounded by everyone curious about who her caller is, and Maho has no choice but to reveal the AI with Kurisu’s memories to them. 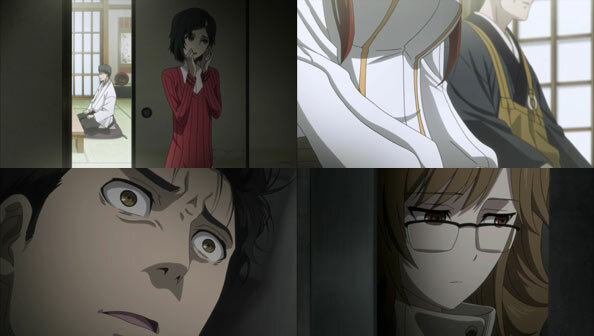 She apologizes to Okabe as the others talk with Amakurisu, but Okabe isn’t mad; he knows he has to start thinking of Kurisu, Amadeus, and Kagari as three distinct individual entities. 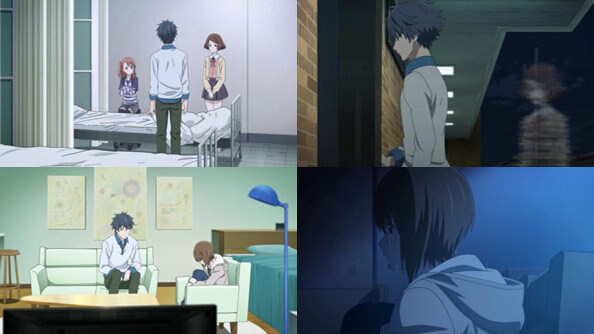 He also needs to keep protecting the world Kurisu sacrificed herself to protect, no matter how much it might hurt or how easy it is to look back. 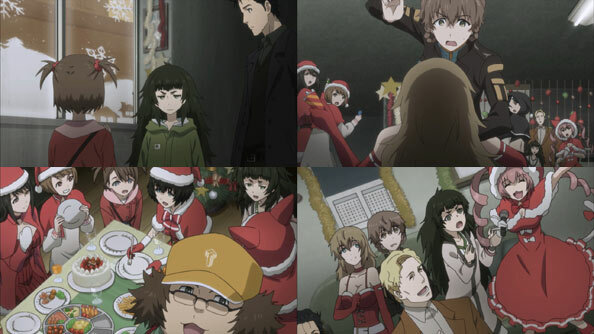 Unfortunately, Okabe is caught quite off guard when an armed gang once again infiltrates the lab and points their guns at Mayushii, Kagari, and the other guests. 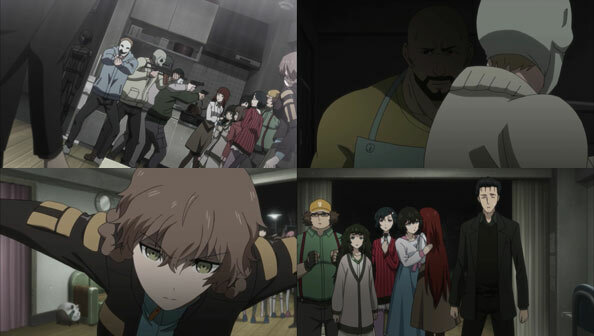 Suzuha is also caught off-guard, so it’s not like Okabe was alone in being lulled into a false sense of security. They weren’t direct witnesses to all of the strange things going on on the periphery of this episode like we did, after all. 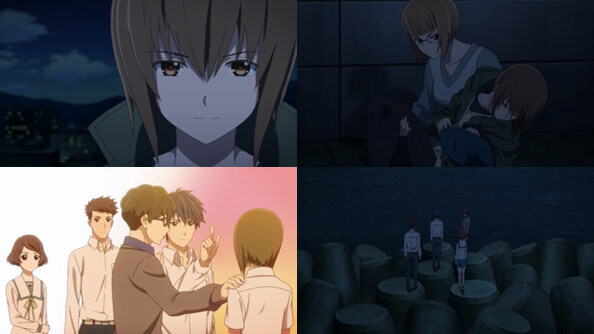 When Kiryuu’s SERN assault team raided the lab back in the first season’s twelfth episode, it marked the official end of “fun and games.” That moment arrives six episodes earlier in S;G 0, and it also has the burden of trying to top that devastating, show-defining moment. 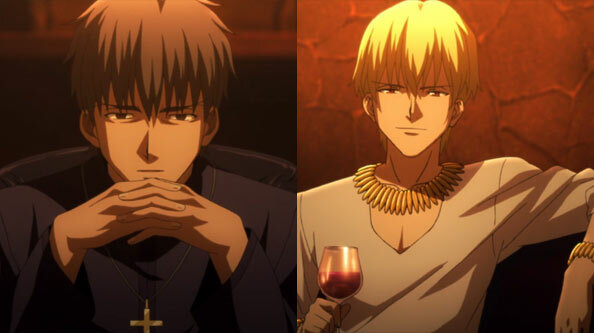 Suffice it to say the ending of this episode wasn’t nearly as shocking, for the simple reason that we’ve seen it before. 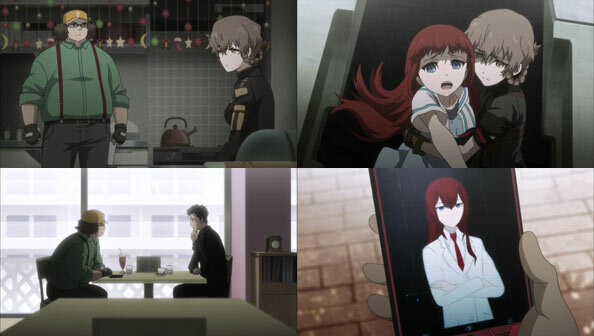 History would seem to be repeating itself, and his loved ones apparently aren’t safe even here, in this Kurisu-less World Line. 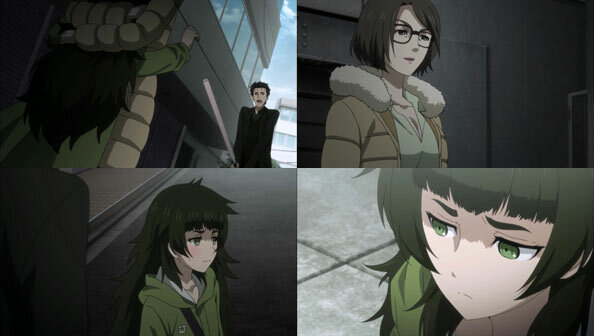 Then again, Mayushii wasn’t shot…yet. 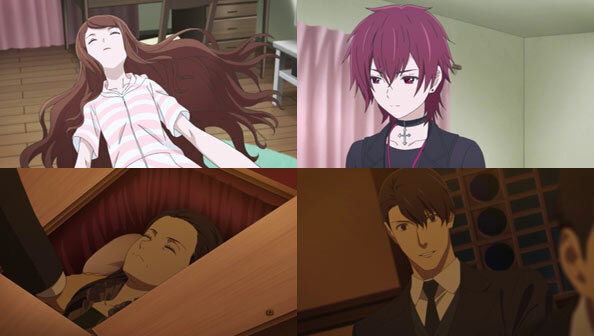 Perhaps, like Kagari and Kurisu, events only resemble what happened before, but may in reality be something completely different. But whatever that ends up being, it probably won’t be pleasant. 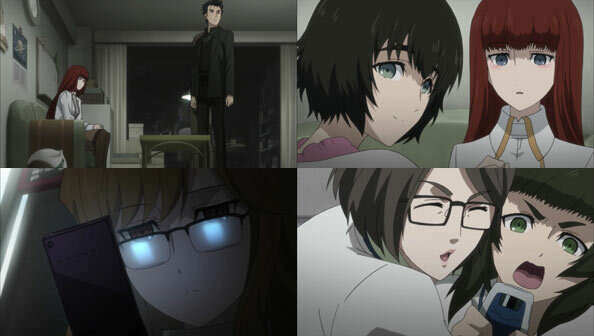 Needless to say, the sudden appearance of Moeka Kiryuu puts Okabe on edge, and even if this is not the same world line in which she killed Mayushii, he suspects she’s still a “Rounder”, and cannot fully trust her. 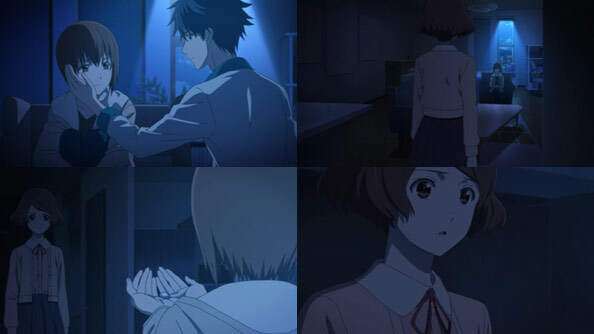 Suzu can tell almost immediately that Moeka is someone Okabe knows (or knew), even if he won’t come out and say it. 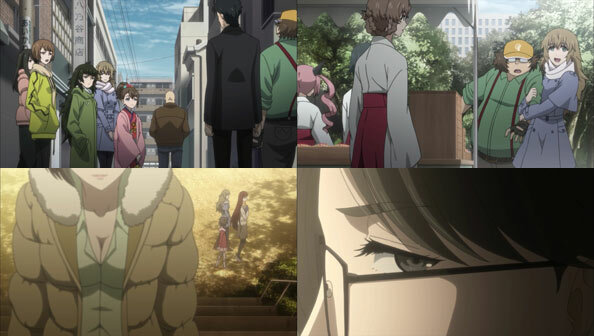 Nevertheless, Okabe assents to Daru’s hiring of Moeka in order to find the lost girl. 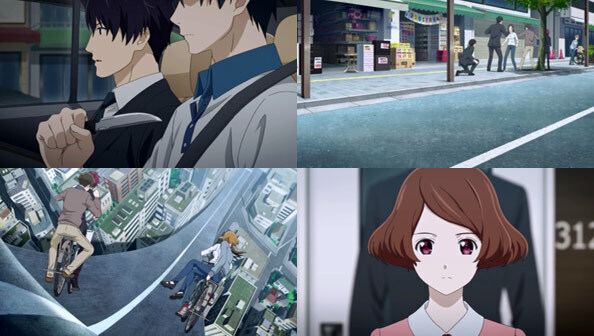 Meanwhile, Hiyajou can tell that Okabe hasn’t been answering Amakurisu’s calls, and feels partially responsible for telling him that Kurisu he knows is dead, even if a part of her is jealous that he was so much closer to her. 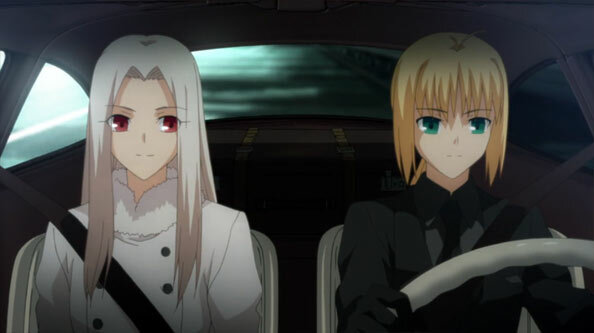 With Leskinen’s unsolicited blessing she strikes out into Akiba to meet with Okabe, but suddenly feels extremely paranoid about being followed. 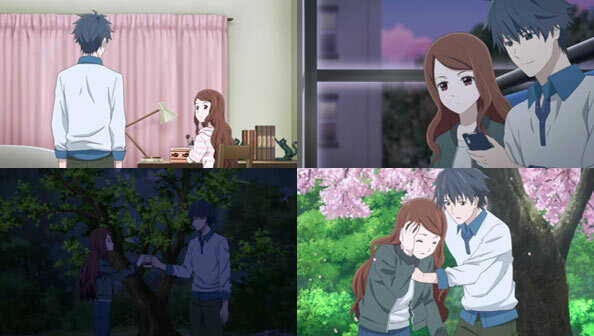 The camera angles, editing, and music all conspire to make us really feel that paranoia, initially brought on by the sudden appearance of Moeka and only intensified here. 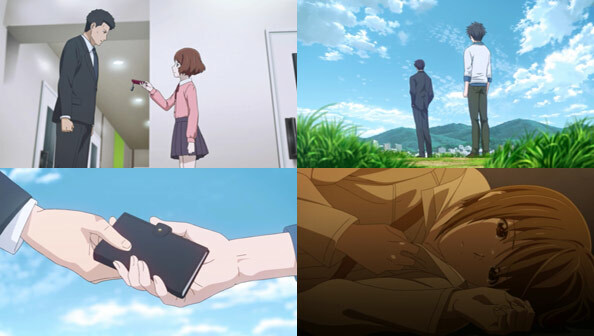 By the time Hiyajou is calling Okabe in a near-panic, and he runs out to find her dropped bag, I truly feared for the worst, as he did. Mercifully (though also a bit disappointingly) the person initiating contact with Hiyajou turns out to be Professor Judy Reyes, a colleague at her university. 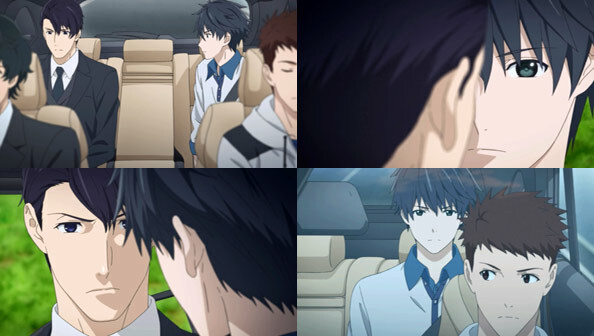 While communicating in English Okabe fails to correct Reyes’ assertion that he’s Hiyajou’s boyfriend (though the prospect makes Hiyajou blush). 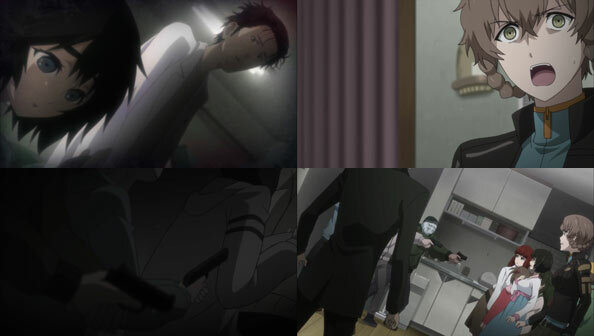 Once they’re alone, Hiyajou brings up Okabe’s lack of responding to Amakurisu. She’s no dummy (obviously), and can tell Kurisu had an incredibly “large presence” in Okabe’s life; far larger than he lets on. 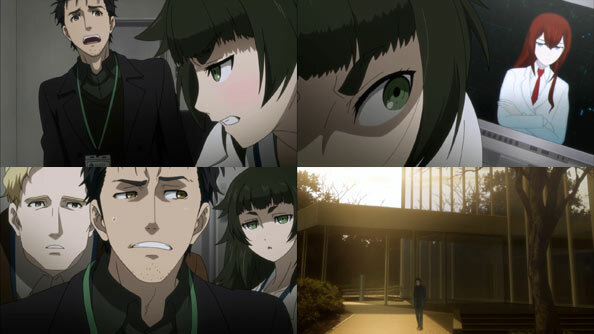 When she reminds him that Amadeus is merely a system, Okabe tells her he simply needs more time. He’s confused, but that’s because he’s not willing to dismiss Amakurisu out of hand, at least not yet (and with no other alternative). 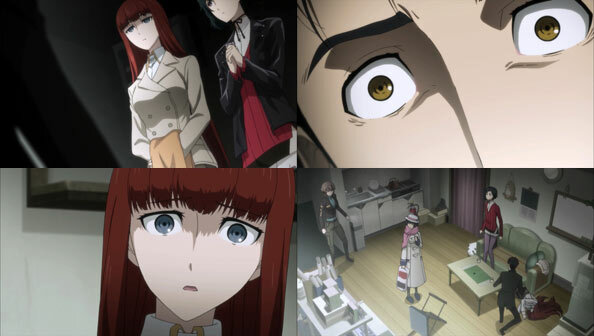 Okabe (and the episode) finally remember the somewhat urgent call Rukako made to him about a guest of his family’s…he comes to the lab with that guest in tow, and Okabe is shocked to find that guest is a dead ringer for Kurisu. However, he later chalks it up as a coincidence (plenty of blue-eyed redheads with bangs out there, after all). 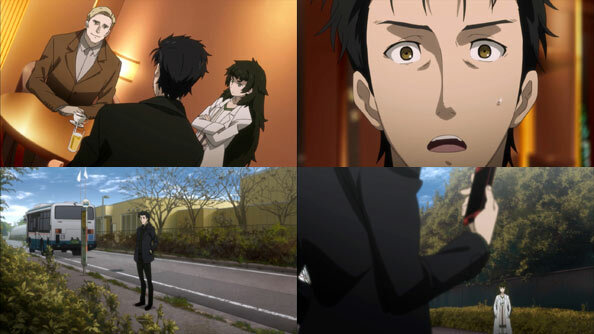 Rukako informs Okabe that the girl has amnesia, and they’ve simply been calling her “Kana” in lieu of her name. 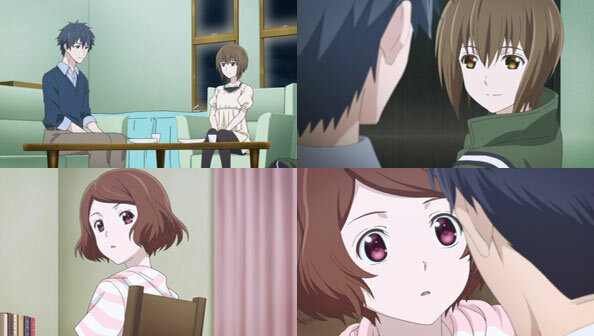 She’s hoping Okabe with all his brainy sciency know-how can find a way to help Kana find her real name, where she came from, and how she lost her memory. 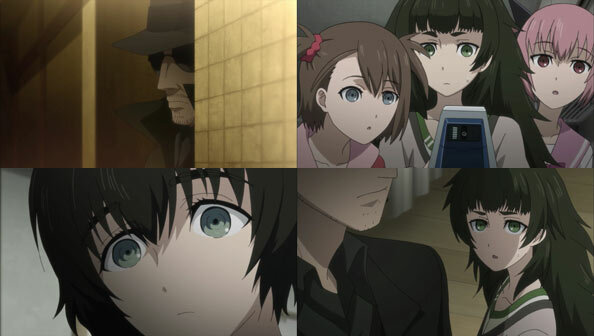 While flattered, Okabe is honest about not being an expert in any of that stuff (even if he knows people who are), but Kana’s identity is quite surreptitiously revealed by Mayushii, who recognizes the oopa that is the only possession of Kana’s that might be a clue. What’s odd is that the oopa is from a very recent movie, but looks like it’s much older than that. 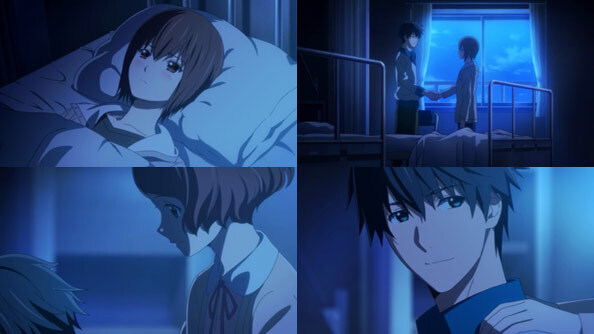 Upon the pointing out of that fact, Kana suddenly collapses, just as Suzuha shows up, and instantly recognizes the girl for Kagari, the girl she lost. Well, now she’s found. 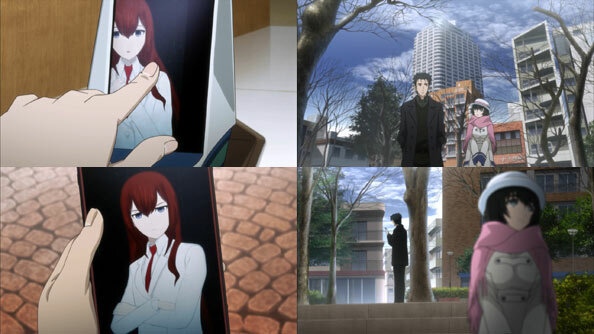 What’s next; and is it merely a coincidence that she so closely resembles Kurisu?